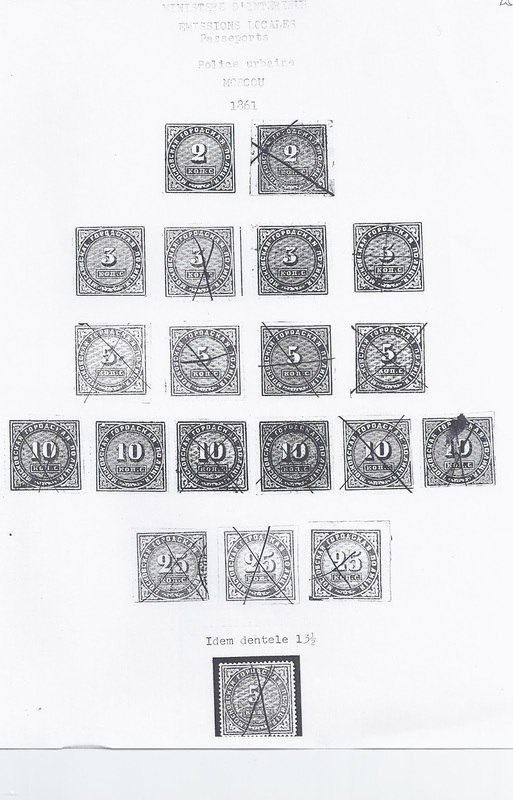 Above is an old Xerox copy of a page from the Emile Marcovich collection of Russian fiscal stamps. 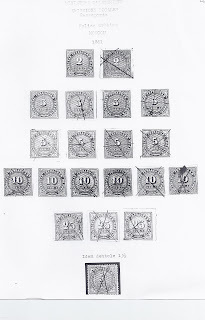 It shows the 1861 Moscow Police issue. I have copies of all the stamps except the last, perforated, one and I have never seen an example of the perforated stamp. The problem with a stamp like this is the possibility that someone has created a variety by perforating an imperforate stamp. True, the perforation is high quality. On the other hand, did Moscow police in the 1860s or even after have access to good perforating machines? And if Moscow perforated , why did St Petersburg not do so for the equivalent 1860 issue of police stamps? In the absence of archive documentation, to establish the credentials of a stamp like this we really need to see an example used on a dated fragment of a document – we know what the documents should look like because plenty exist. We also need to see more examples of the stamp itself. Any offers? Bova-Luk'yanov-Turchinskiy catalogue (BVL) mentions 3k. and 5. values with the 12,5 perforating.